The iOS Cleverbot app optionally features our Cleverlips! voice tech, allowing you and your app to talk out loud. 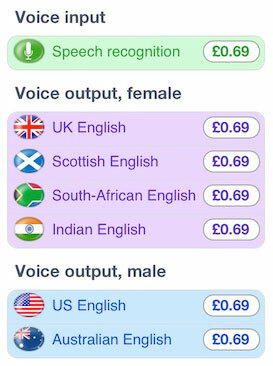 Speech recognition and voices are powered by Nuance software, also used by Siri and Dragon Dictate. That costs us, so we do have to charge for the features. We've added clever lips! When it might be time to talk, big white lips appear above the speech bubbles, automatically. One easy tap, and the lips glow orange as they get ready, then pulse pink and you can speak. Talking to Cleverbot has never been so quick and natural! More voices are on the way, and there's a value pack for all of them at once. Prices will appear in your own currency. News flash! From January 2015 we also have Spanish voices!